Even though carbon is one of the most-abundant elements on Earth, it is actually very difficult to determine how much of it exists below the surface in Earth's interior. 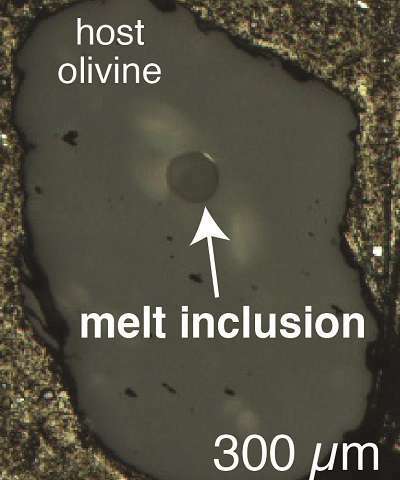 Analysis by Carnegie's Marion Le Voyer and Erik Hauri of crystals containing completely enclosed mantle magma with its original carbon content preserved has doubled the world's known finds of mantle carbon. The findings are published in Nature Communications. Overall, there is a lot about carbon chemistry that takes place below Earth's crust that scientists still don't understand. In particular, the amount of carbon in the Earth's mantle has been the subject of hot debate for decades. This topic is of interest because the amount of carbon present in the mantle underpins our planet's geological processes, including triggering volcanic activity and sustaining the biosphere. It also affects our atmosphere when carbon dioxide gas is released by eruptions; volcanic eruptions played a large role in pre-historic climate variations. But it's difficult to measure the amount of carbon that exists below the Earth's surface. Scientists can study the igneous rocks that formed when mantle melts, called magma, rose to the surface, erupted as lava, and hardened again to create a rock that is called basalt. However, the process of ascent and eruption releases almost all the magma's carbon as carbon dioxide gas, which makes the erupted basaltic rocks poor indicators of the amount of carbon that was in the magmas from which they formed. "This is how explosive eruptions happen," Hauri explained. "The sudden catastrophic loss of gas that, before the eruption, was dissolved into the magma at high pressure, but during eruption has nowhere else to go, leaving no post-eruption trace in the hardened basalt of the amount carbon once present." "This is only the second time that samples of magma containing their original carbon content have ever been found and analyzed, doubling our knowledge of the region's carbon chemistry," Hauri said. The very first samples containing their original carbon were also revealed at Carnegie, by Hauri and Brown University professor Alberto Saal, in 2002. Those samples came from the Pacific seafloor. Comparison of the data for these two samples revealed that the mantle's carbon content is much less uniform than scientists had previously predicted, varying by as much as two orders of magnitude in different parts of the mantle. 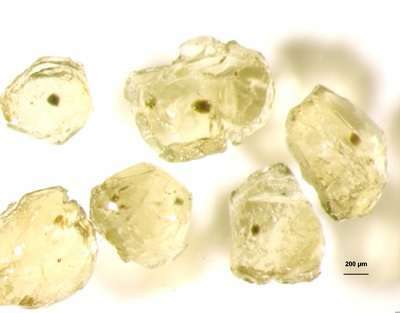 "Our discovery that mantle carbon has a more complex distribution than previously thought has many implications for how mantle processes may vary by location," added Le Voyer, who conducted this research as a postdoc at Carnegie and is now at the University of Maryland.